I sat down with ourselves + others, a three-piece band from Houston, Texas. The band consists of Jonathan Barrett on keys/vocals, Stephen King on drums and Mateo Rodriguez on guitar, keys and vocals. We discussed the origin of the band, musical inspirations and influences, and their goals for the next few years. HEM: So how did you guys form and where did you meet? Stephen: That is a complicated story. It started with the two of them. Jonathan: When Mateo and I were fourteen, we wanted to be in a band together. But, the band didn’t end up happening. However, we did come up with the name ourselves + others. I said,”Cool phrase!” because I said it in a sentence and thought it would be a cool band name. Later in high school, Stephen and I wanted to both do some covers for the talent show. I didn’t really know him very well but he heard me playing the piano outside the choir room, one day. He came in and we played together and I was like,”I think his name is Stephen?” then I DMed him on Twitter asking if he wanted play some cool covers with me for the school talent show. So with that, it went really well and after the show I told him,”hey! I have this band named, ourselves + others that me and my friend came up with a few years ago, do you want to use it and start doing this [playing music] some more?” and he said [Stephen], “Yes. Sure!” A bit later, Mateo started to get back into the picture and hinted that he wants to be part of everything and joined the band. At a Starbucks, Stephen and I wrote our first song “Weatherman” and put it on Soundcloud. When we first got together and Mateo joined, we redid some of the demos we already had and compiled it into an EP called Rudiment, ever since July, and we’ve been promoting it. We try to play for as many people as we can and that brings us to now. Stephen: I was a student at UT [University of Texas - Austin] and then Jonathan and I played a show together in Dallas, it was a Hurricane Harvey benefit show. That show was “the show” that made me decide that I wanted to do music full time because I had to leave the afterparty early because I had an exam the next day, but everyone was having a blast at the party. I was sad and stressed, so I decided,”You know what! I don’t wanna be in school anymore, I want to do what really makes me happy - which is music!” So that was my last semester at UT and now I make music. HEM: Were there any other weird band names before ourselves + others? Jonathan: I don’t remember that! Jonathan: Isn’t that the polar opposite of what it ended up being too? Mateo: But could you imagine being called cutting ties? Jonathan: We also make a joke that we have the band be “The Problem” just so we can call the fanbase, part of the problem. 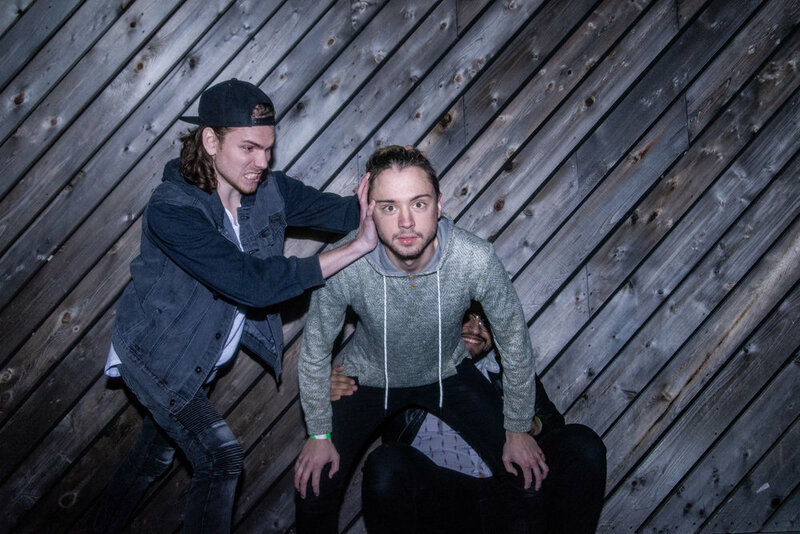 HEM: So you guys mentioned you released “Weatherman” in 2018 or 2017? Stephen: Well it’s been a hot minute! We released the original version - demo in July 2017! The reason I know this because we released Rudiment on all the major streaming services, exactly a year later. Mateo: We had the EP release show, outside of Stephen’s house on his cul de sac. HEM: What did you guys do to go about writing and deciding would be on the EP? Jonathan: Well, “Weatherman” was definitely going to be out first song because Stephen and I were working on it. I wrote the lyrics and Stephen brought in some lyrics and music he was working on. We flushed that out, right before Mateo was in the picture. Whenever we started performing original music, “Weatherman” was always a great opener. So we figured that it would be a great opening track. We are friends with the band, No Rehearsal and they recommended us to this studio in Austin that they have been to and recorded their music at. We went into that studio with three and half songs written, our song “Fernweh”, which was nonexistent when we arrived at the studio. We were there five days, saw the sun a few times. From start to finish, “Fernweh” did not exist but was fully recorded in maybe thirty six hours. I remember it being five in the morning, the drums were already recorded, which came from us jammin our in the live room. Stephen and Mateo were working on guitar, and I’m just sitting there at five in the morning trying to think about what this song will be about. Stephen: I went to bed at about 5:45 and he [Jonathan] was sitting there on the floor, humming to himself, trying to find the right lyrics. The place that we actually did it at was called Westfall Recording Company. Jonathan: Shoutout to Anthony Santo for this opportunity! Stephen: This is the guy we worked with at the studio, he was a very chill guy and pleasant to work with! HEM: When you guys released your EP, how would you describe your style and sound collectively? How would say your defined genre would be aside from being called synth-pop or rock? Mateo: I’d like to say that the term “alternative” is absolutely useless in 2019. Jonathan: I don’t really know! We make whatever music that comes out! HEM: Let’s see, how would you guys like to make people feel when they listen to your music? Stephen: Well, I was saying that it’s okay to not be okay. Jonathan: I want to write lyrics that people can find themselves in obviously. I discovered that, that comes through in the utmost transparency from me. Honest feelings and maybe not the most specific details, where people can themselves in it like happy feelings, sad feelings or situations where they remember themselves being in before. At the live show, playing the music, our goal is bring people together, dance around, have fun, while all being aware of those songs and what that means to them. Stephen: I’d like to say that my biggest goal in doing music is that is just to have a positive impact on one person’s life. If one person can feel positively impacted by our music then I will feel like a success. That’s the type of community that we want to foster around what we’re trying to do. We just wanna foster community that all feel like they can fully express themselves and be who they want to be, and nothing will hold them back. HEM: I really love those answers! I tend to get general answers on what musicians would like fans to feel like during their lives shows. For example, some bands would describe their shows almost like a hazy dream. Jonathan: To me, the experience is of listening to music and the experience of going to show are two totally different ventures. There are some songs that I want, with the production of course, to be hazy, to feel sad or reminiscent, mabe even want to cry as well? A show, is an event or a convention featuring the songs that we’ve made. The vibe to our songs don’t always have to translate to live because our shows, as a whole, is something that everyone is involved in. No one wants to go to a show and be hazy, but everyone wants to have a good time. Stephen: We just want to say that we want it to be a big party and everyone is celebrating. It doesn’t matter what you’re celebrating. You can be celebrating something tangible like an A on a test or a pizza! You can be celebrating being alive or anything! We want it to be a celebration and a way to escape from any problems that you’re having for half an hour or hour, or however long the set is. We don’t want you to worry about anything that you’re going through. A place that you can escape to be happy for a while. Stephen: Also real quick to what you were saying about genres, we are open to suggestions! HEM: I’d definitely take that as a compliment. They were able to think of someone that they can think of relates and describes your style. Jonathan: *Sarcastically* We are very inspired by Jacob Sartorius and Jake Paul. HEM: In terms in inspiration, what artists and musicians inspired you guys to pursue music? Jonathan: As far as making music, to get that out of the way, I have a different favorite band, every few months. I’m VERY into The 1975 right now. HEM: What about that one band that you favored growing up? An example, for me, used to be WALK THE MOON. Jonathan: WALK THE MOON was one of my favorite bands. Mateo: WALK THE MOOn was my top artist of 2018. Stephen: WALK THE MOON is probably the biggest influence to the sound of our music. Mateo: For our track, Messin’ Around, the place this inspiration came from can range from to current [music] to Pink Floyd. Whenever I wrote that song, I had “Comfortably Numb” in mind and I didn’t want to be too obvious about it, so I tried to make it different. So that’s inspired the last two minutes of that song. Stephen: There’s parts of our songs that come from inspirations of other musicians like twenty one pilots, AJR, even “Africa” by Toto. There is something in our EP, of one of the songs, there is a part that is directly inspired by little flute thing solo in Africa. If you can find it, tweet us. Jonathan: It’s one little part of one little instrument in one of the songs. Stephen: We’ll send you a muffin basket, in the mail, if you can figure it out. Mateo: In terms of people that had inspired me to pursue music, it’d probably have to be Ed Sheeran. Stephen: Being compared to Ed Sheeran was massive praise. Mateo: People like Ed Sheeran and Robert Delong as well. The way Robert Delong performs is amazing. Stephen: Growing up, The Beatles inspired me as well. My dad always listened to them while I was growing up and Led Zeppelin. As I got older, Imagine Dragons was the first concert that I decided to go to on my own and Imagine Dragons was where I fell in love with live music. I saw them six years, ever since then, doing live shows where I feel like it’s my favorite thing. I get so much information from these fantastic live artists that I’ve seen and I wanna be able to replicate the feeling I get from being at their shows so other people can feel the same way. Bigger alternative artists like twenty one pilots, they put on a crazy live shows! I love Sir Sly! I also really love Jon Bellion. Mateo and Jonathan: Ooo! Why did we think of that? Stephen: Jon Bellion as been a huge inspiration for us for us, production-wise. The message and story that he puts out, he dropped out of college and inspired me lots. I also love rap. I love live rap shows, specifically BROCKHAMPTON. Musically, rap doesn’t influence our songs very much but the live energy is something that I love. Those are the types of shows that I try to be losing my mind, drenched in sweat and needing water desperately because of things like people putting 110% of their passion on stage. That’s what I should be doing. That’s what everyone should be doing. I shouldn't give anything less than all. HEM: Is there a dream venue that you guys have? Mateo: First, The Revention Center. I’m thinking local and I keep thinking Cynthia Woods Mitchell Pavilion. HEM: What about we name local venues first then expand from there? Jonathan: I would love to headline a show at White Oak Music Hall. Stephen: I’ve been to a couple shows at Terminal 5 and I would love to play there. That place is fantastic! Jonathan: *tries to cut off Mateo* Antarctica!!!! Stephen: A couple favorites of mine, The Fox Theatre and then Newport Music Hall in Columbus,Ohio. Mateo: You know where I really want to play? Stephen’s garage! Stephen, Mateo and Jonathan: YES!!! HEM: Where do you guys see yourselves in five years? Jonathan: There were some people here that I had met for the first time and 98% of the crowd were family, friends, coworkers and people that I’ve added on snapchat a few years ago. We played in front of people in the area that we’ve ever known tonight. Only recently, we’ve become super super comfortable with our set, we’ve always been working our way there. We were ready to share everything tonight with no insecurities whatsoever. The fact we were able to do this tonight in front of some many people, it left an impact on us to have a very good time.In a few years, I think we could sell out The Revention Center and or Cynthia Woods. Jonathan: Success to me, looks like a group of people, smiling, having fun and loving each other and enjoying being alive together. When I think of success for me, when it would make me think it was worth it, anytime a group of people gets bigger or happier. With the amazing performance and stage energy that they had at the show in Houston, Texas, the band is definitely on the rise as they continue to play shows in Houston. Discussing what music means to them, their goals and even making a few jokes here and there, Ourselves + Others is definitely a local band that you must see. You can check their music out on all streaming platforms as Ourselves + Others, follow them on twitter and instagram as @ourselvesothers.